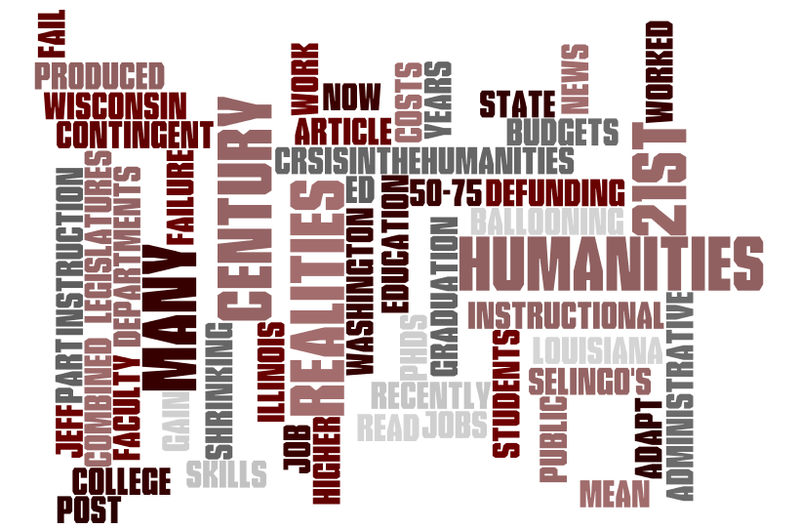 What do we mean by #crisisinthehumanities? Is it 50-75% instruction = contingent faculty? Is it ballooning administrative costs combined with shrinking instructional budgets? Is it defunding of public education by state legislatures? Louisiana, Wisconsin and Illinois have all been in the news recently for this. Is it failure to adapt to 21st century realities on the part of those in the humanities? Read Jeff Selingo’s Washington Post article on why so many college students fail to gain job skills before graduation. Is is that too many PhDs are produced for too few jobs? For 20 years, I worked in humanities departments in higher ed. Now I work on 21st century realities. In private conversations, I’ve talked a lot about the demise of the humanities. And in these terms: if you’re committed to the status quo, you’re clinging to a sinking ship. The reality is that some (many!) humanities departments on a lot of campuses are in trouble. Pressure from administration to be “income generating” in the wake of state defunding confounds traditional humanities scholars who cannot conceive of what “income generating” means for them. In addition to that pressure, low enrollments threaten courses, programs, and teaching jobs. Students aren’t signing up for the status quo courses. Preparing undergraduate students with “mini PhDs” in the humanities field is not enough–no matter how much it educates the whole person and teaches essential critical thinking and analytical skills. The reality is that the very foundation of higher education has changed. It no longer prepares future academics. Because it prepares such high numbers of students, the reality has become that higher education sends the vast majority of its graduates into the professional world. We already know that we’re over-preparing academics–there’s a true crisis of disproportion in the world of too many PhDs for not enough jobs. This lopsided demand contributes to the adjunct crisis, wherein adjunct faculty are compared to the underpaid exploited labor force working in the fast food industry (adjunct walkout day is in the news today–see stories here and here). So the last thing we need to do is prepare more academics by training more undergraduates to pursue graduate studies in the humanities. These are huge intellectual problems that will probably take decades or generations to solve. In the meantime, let’s do we have to do to keep the humanities afloat: namely, professional development training for undergrads enrolled in our humanities programs. You don’t have to throw away the traditional curriculum to do this. You can weave professional development preparation into already existing curricula. And you can do it piecemeal. For example, try weaving networking skills through a single course–see this post for details on how to do that. Before agreeing to write a letter of recommendation, ask students to make the connections between your course and whatever it is they are applying to–that makes your job easier (you can cut-and-paste whatever they produce into your letter template–see this post for details). This exercise provides students with important practice for cover letter writing in which they will have to connect their own skills & experiences to specific job qualifications (see this post on the importance of connecting the dots for employers). Always be explicit with students about the career prep you are doing with them! You don’t want to be the crazy professor who made students shake hands in class all the time or randomly ratcheted up presentation standards. You do want to be the professor who clearly and explicitly helped students prepare for the practical world of the workplace even as you delivered the traditional humanities curriculum. My article in the March/April issue of The Language Educator, “Creating a Learner Centered Classroom to Prepare Students for Life Beyond the Classroom,” details some strategies for weaving professional development training into humanities curricula. How Can You Connect Your Language Major to Your Career Aspirations? How Are Your Language Experiences Represented on Your Résumé? How Do You Choose One Word to Describe Your Language Level on Your Résumé? How Do You Illustrate Your Language Level on Your Résumé? Can You Explain Everything on Your Résumé Clearly and Concisely? Can You Highlight Your Language Studies at Networking Events and in Interviews? Let me know if we might cross paths in any of those locations! 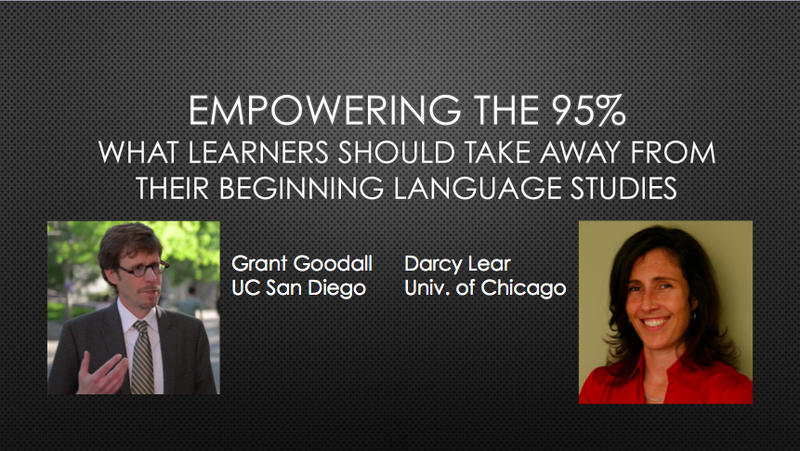 This entry was posted in Careers for Humanities Majors, darcy lear, Professors Best Kept Secrets. Bookmark the permalink. 1 Response to Is There a #CrisisInTheHumanities?